Who said salads had to be boring? Warm pumpkin and toasted pine nuts mix perfectly with Cheshire Cheese in this delicious Autumnal salad. 1. Preheat the oven to 200°C / fan oven 180°C / Gas Mark 6. 2. Cut the pumpkin or butternut squash into 2.5cm/1 inch cubes and tip into the roasting pan. Add the olive oil, season with pepper, then toss to coat. Roast for about 25-30 minutes, turning once, until tender. 3. Meanwhile, lightly cook the green beans for 4-5 minutes in boiling water. Drain, then rinse with cold water to cool quickly. 4. Put the red onion, green beans, spinach, watercress, lambs lettuce or rocket and tomatoes into a salad bowl. Add the Cheshire cheese and pine nuts. 5. Make the dressing by whisking together the olive oil, walnut or sesame oil, vinegar and mustard. 6. Season with black pepper. Add to the salad with the warm roasted pumpkin or squash. 7. Toss the salad, share between 4 bowls and serve immediately. 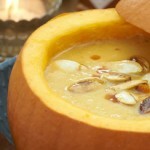 Mini pumpkin soups. A must-try for pumpkin fans.